This site describes the composition, dynamics, and consequences of the Earth's magnetosphere. 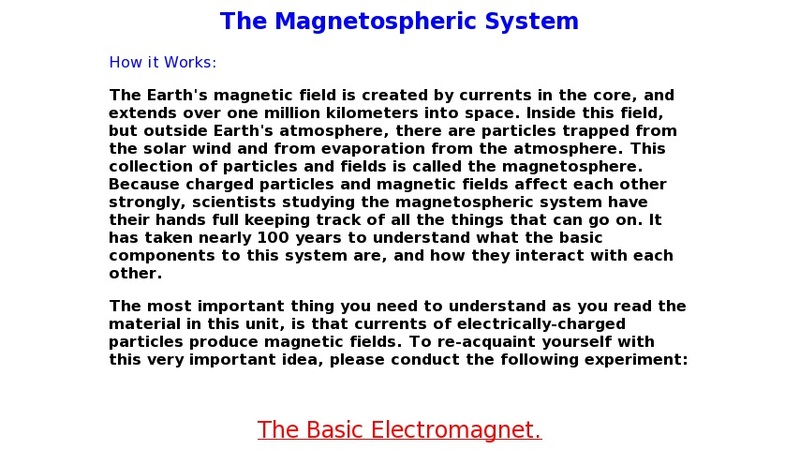 It starts with an experiment and a review of the basic electromagnet and then describes basic components including the Earth's magnetic field, the plasmasphere, the Van Allen Belts and trapped particles, and the ring current. The author lists the inputs as solar wind particles, electromagnetic radiation, magnetic fields, and terrestrial atmospheric atoms. Outputs include electrical currents flowing into the atmosphere and particles ejected back into the solar wind. The resulting processes are also listed.